Let me introduce you to one of my favorite snacks. 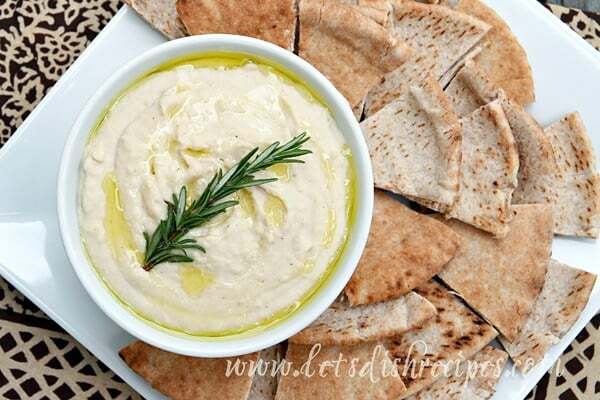 White Bean Dip with Rosemary and Olive Oil. Yes, it does look a lot like mashed potatoes. Which isn’t a bad thing….but this white bean dip is much healthier. I don’t feel so bad eating the whole bowl myself! Which I do. Often. The olive oil drizzle makes for a great presentation, but if I’m making a batch for myself I just warm all of the oil, garlic and rosemary together. Then I process that with the beans and other ingredients. This is great with pita chips, veggies or toasted baguette slices. In a frying pan over medium heat, stir half the olive oil and the 2 cloves garlic for about one minute, until garlic is fragrant but not browned. Pour the oil and garlic into a food processor. Wipe out the pan and set aside. Add white beans, lemon juice, and salt to the food processor and process until smooth. Pour into a serving bowl. Return the frying pan to medium heat and add the remaining olive oil and the rosemary sprigs. Warm the rosemary in the olive oil until fragrant, about 3 minutes, stirring occasionally so the rosemary doesn’t burn. Remove from heat and cool for 10 minutes. Discard the rosemary and drizzle the olive oil over the bean dip. Who Dished It Up First: Adapted from myrecipes.com. Originally published in Sunset Magazine. 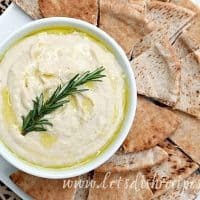 This was such a wonderful variation of hummus! Instead of white beans, I used some great northern beans. I had made a huge batch of white chicken chili last week and used one of those industrial sized cans of beans and had just enough left over. So much flavor packed into this dip! I think that you could probably omit the salt (or maybe add just a quarter teaspoon) and still make a totally awesome dip. Thanks for changing up my diet a bit! LOL! !